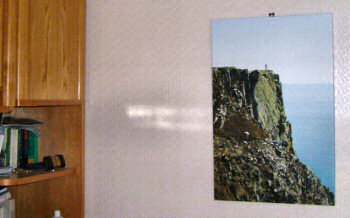 I think it was in August 2006 during my next visit to Islay that the second stage started. During that visit I also met Mark in his studio again and we started talking about the picture. I didn't have the money then, but the plan to give a large print of the picture as a present to my parents was hatched during that visit. 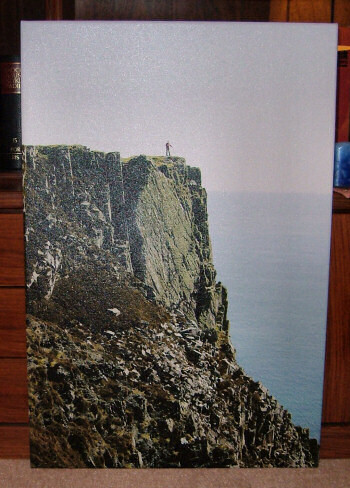 Later in the year my financial situation improved and I was able to promise my parents their Christmas present: A large print of a picture of me on the top of the cliffs of The Oa on Islay. Now the only problem we had to solve how to hand over the present in style and how to get it to Germany. 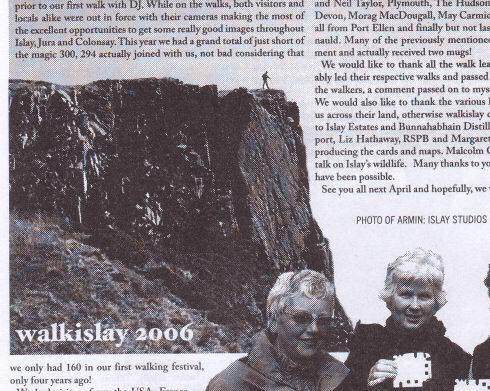 The solution for this was fairly simple, or so we thought: Over Christmas 2006 we started planning a family holiday on Islay for summer 2007, where I would buy the picture and my parents would then take it home with them to Germany. Sounds simple enough, doesn't it? The holiday was planned and booked. I told Mark to get the picture ready. In mid June we arrived for our holiday on Islay. We picked up the picture at Islay Studios. Only when my parents were getting ready to leave we just couldn't fit the picture (or to be precise the frame) into their suitcase. It was too big. In the end I just took the picture home with me, wrapped it up well and sent it over to Germany as a parcel. My mother then found someone who could pull the picture on the frame in Bremen. So now the picture of their son in one of the most beautiful places on Islay is finally hanging on the wall in my parents house. Thanks Mark for a great picture!